The ranking member of the Judiciary Committee is again denying she breached the confidence of Christine Blasey Ford, who claimed Kavanaugh sexually assaulted her when they were in high school. Kavanaugh denied the allegation. The crowd at an Iowa rally for President Donald Trump is chanting “Lock her up!” about Democratic Sen. Dianne Feinstein of California. Trump has alleged that Feinstein, the ranking member of the Judiciary Committee, leaked an allegation of sexual assault against Supreme Court Justice Brett Kavanaugh by Christine Blasey Ford in an attempt to sink his confirmation. Feinstein denied her office was the source of the leak. Ford sought to remain anonymous in a letter with her accusation that Kavanaugh sexually assaulted her when they were teenagers, but after reporters started contacting her, Ford went public. Kavanaugh denied the allegation. President Donald Trump is celebrating the swearing-in of Supreme Court Justice Brett Kavanaugh as he seeks to boost Republican enthusiasm going into next month’s midterm elections. Speaking at a rally in Council Bluffs, Iowa, Trump says Kavanaugh was “proudly” sworn in Monday in a ceremonial event at the White House. Trump’s mention of Kavanaugh drew rave applause from the crowd of thousands in the western Iowa city. Kavanaugh faced multiple allegations of decades-old sexual misconduct as the Senate considered his nomination. Kavanaugh denied the accusations. He was confirmed on Saturday. Trump says: “I want to thank our incredible Republican senators for refusing to back down.” He also praised Republican Sen. Chuck Grassley of Iowa as “a very tough cookie” for how he handled the confirmation process. This item has been corrected to show that Council Bluffs is in western Iowa, not eastern Iowa. 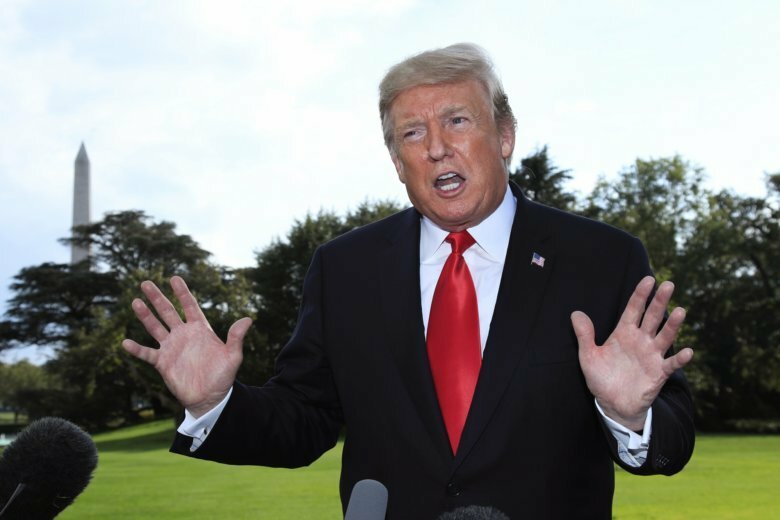 President Donald Trump says his second summit with North Korea’s Kim Jong Un will have to wait until after next month’s midterm elections. Trump tells reporters traveling with him to a rally in Iowa that he doesn’t have time for a foreign trip as he’s crisscrossing the country holding rallies to try to boost Republican turnout in November. President Donald Trump is heading to Iowa to boost Republican candidates and roll out new summer fuel standards. Trump’s rally in Council Bluffs is the latest stop on a busy tour campaigning for Republican candidates in the lead-up to November’s midterm congressional elections. Trump is expected to announce a long-expected move lifting the federal ban on summer sales of gasoline with high-ethanol blends that will allow year-round sales. The change is a boon for Iowa and other farm states that have pushed for greater sales of the corn-based fuel. It’s also seen as a reward for Iowa Sen. Chuck Grassley, who led the contentious but successful fight to confirm Brett Kavanaugh to the Supreme Court as Senate Judiciary Committee chairman.